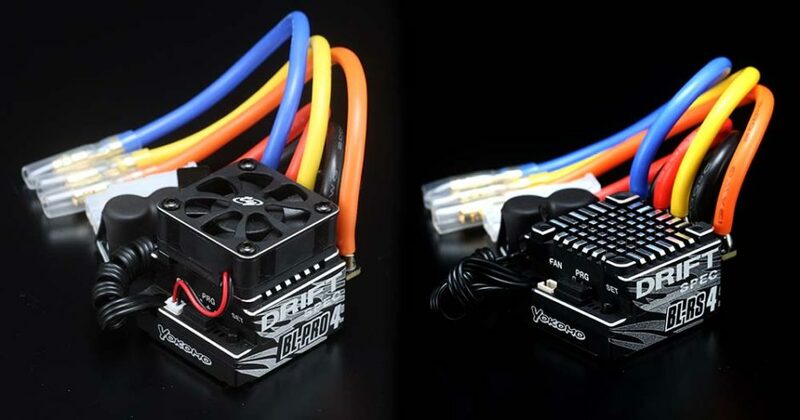 Yokomo’s BL series ESC emerges with the best specifications for drift! Team Yokomo has been tested and found the best set up for 10.5T and 13.5T Drift spec motors. By referring to the settings below, you can enjoy the comfortable drift driving by demonstrating the performance of BL-PRO4D / RS4D to the fullest. ●ESC set up need to be changed for adapting less than 10.5T motor (such as 8.5), Boost rate need to be reduced, otherwise the motor will be broken due to super high rotation. ●Once the temperature of motor increased, please stop the car for cooling down the motor. Gear ratio and Boost shall be down from the original set up. In case if use Power Curve in between 3 to 8, you will be able to get more grip once you select more small numbers. In case of high grip surface, set up high rate for increasing the starting power. Must be in between 0-30%. In case of low grip surface, increase the rate for preventing from oversteering. Break Frequency need to be higher set up for the mild break, then the behavior of the car will be more stable at breaking. Increasing Motor Frequency will have more stable car control to prevent from wheel spin at the start. Special Programming card will be needed in separately.